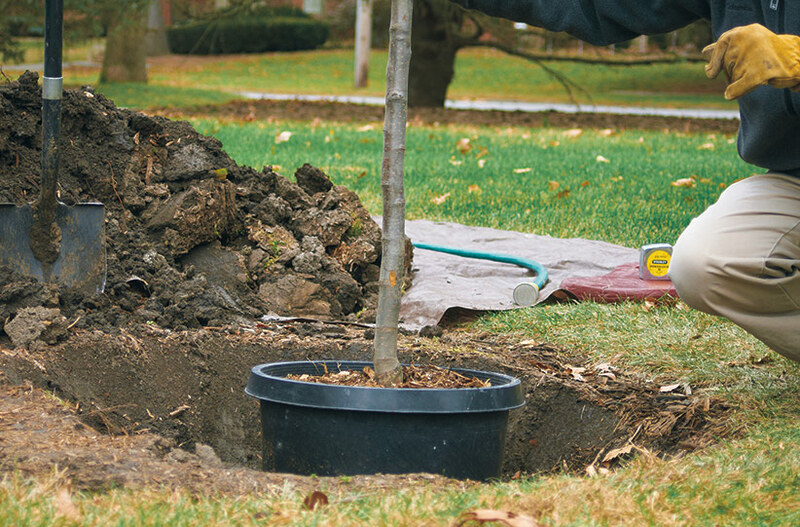 Follow these four simple steps to start a tree off right in your garden. Trees add structure and shade to a garden and value to your home. But first they need to be planted. Here’s how in four easy steps! 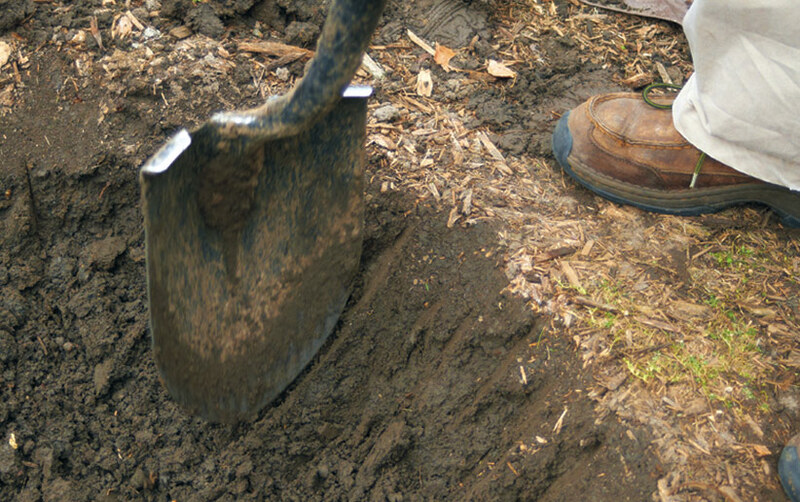 Dig a hole two to three times the width of the root ball. Test the depth of the hole by setting the tree in it. 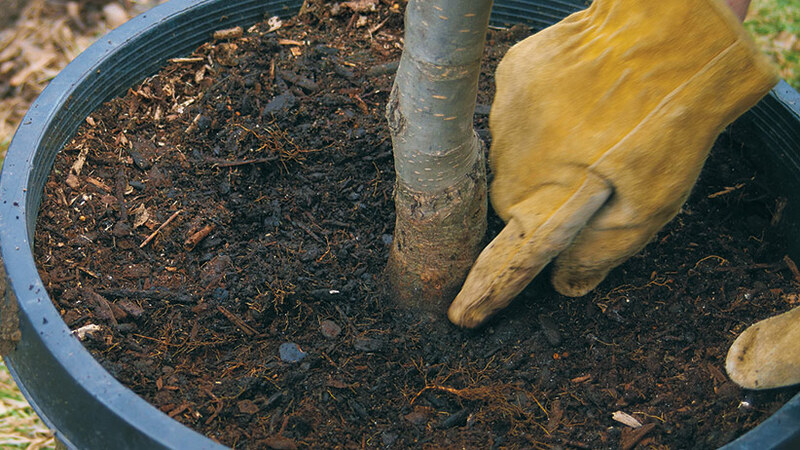 Don’t get it too deep—you want the soil line right where it is on the tree in the container. The one in the photo above is perfect. In the photo above, you’ll see how to rough up the sides of the hole. Slick, smooth sides make it difficult for the roots to reach out into the soil. Speaking of soil, even if your soil is poor, don’t try to amend it. It’s impossible to amend soil in a space big enough for a tree—it’s better to choose a tree that tolerates your soil just as it is. In general, you want to disturb the roots as little as possible. But if you take the tree out of its container and the roots are potbound and circling as in the photo above, loosen and tease them out with your hands. This will stop them from circling and help them to grow out into the surrounding soil. Prune off any damaged roots at this time, too. Set the tree into the hole, making sure the root collar is at the correct level. Backfill the hole halfway with the original soil, then fill the hole with water as the photo above shows. Wait for the water to soak into the soil and then finish filling in the hole. 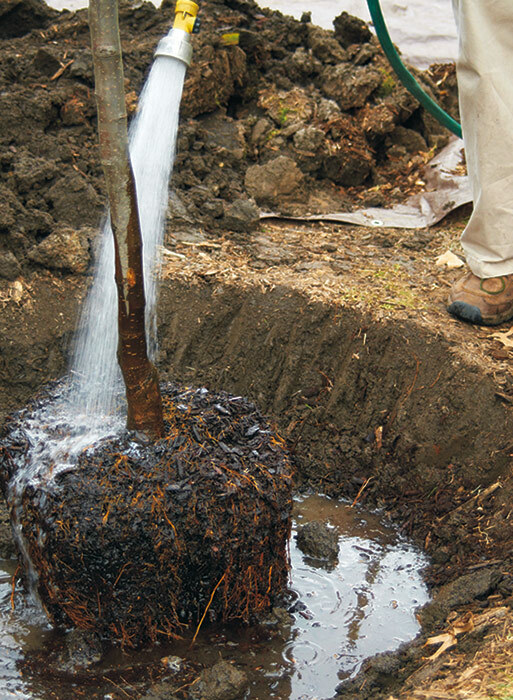 Firm the soil around the trunk and water again to remove air pockets. Don’t fertilize the tree yet. Just let it settle in. Wait until spring, and then feed lightly, but stay away from chemical fertilizers with a lot of nitrogen (the first number in the analysis). This stimulates foliage growth and you want your new tree to put its energy into root growth. 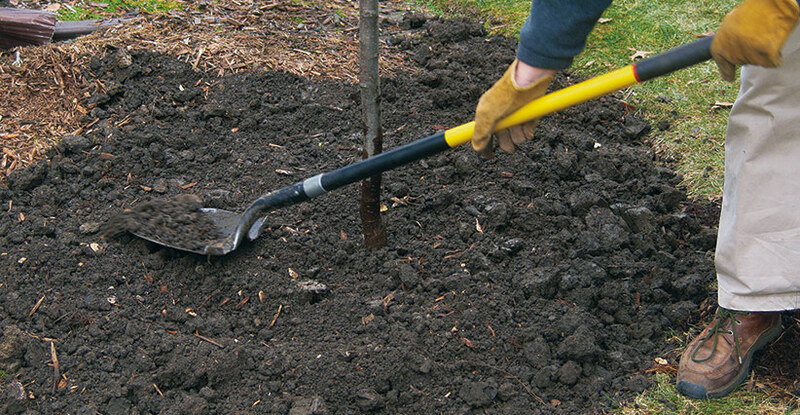 Once the tree’s in the ground, top the soil with a 2- to 4-in. 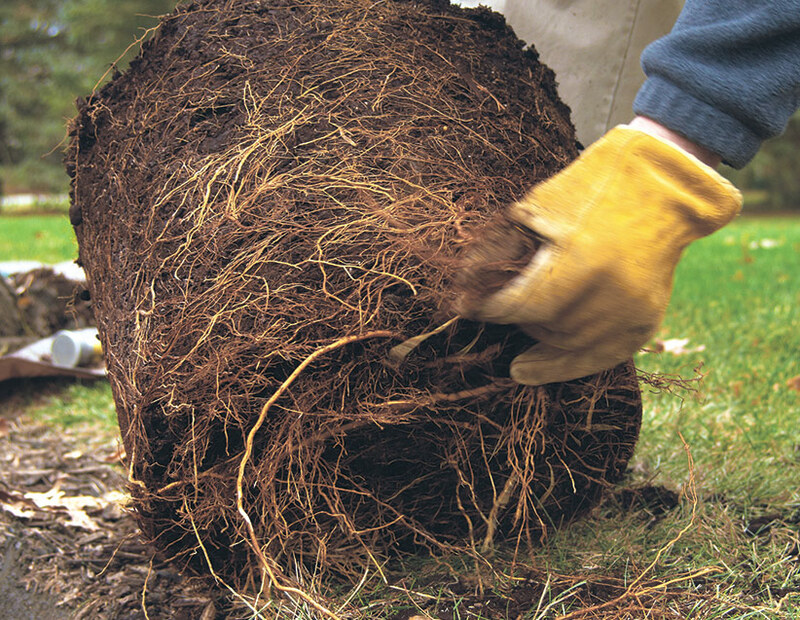 layer of organic mulch, such as wood, compost or shredded leaves, as you can see in the photo above. Organic mulches hold soil moisture and improve the soil as they break down. 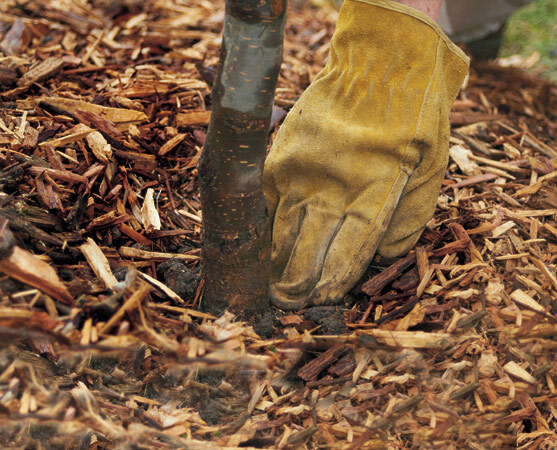 Don’t let mulch touch the trunk, as it holds moisture against the trunk and damages the bark. Avoid stone mulch. It can heat up the soil and “cook” the roots or stimulate the tree to grow during its dormant season. Remove broken branches, but otherwise give the tree a year or two before you do any pruning, as it needs as many leaves as possible to manufacture food. Use tree wraps only on young trees during the winter to protect tender bark from cold damage. They can harbor insects if left on during the growing season.